One of the things you can "grow" on your Konohana farm is fish. Before you can do so, you need to get your farm expanded. You'll need to have Eileen build the first three Make Field "C" expansions and the Make Waterwheel and Rice Paddy "C" expansion. After the waterwheel and sluice gate has been crafted, Eileen will give you the option to build the Fish Pond. You will have to give her 80,000 G, 20 Material Stone, and 10 Lumber. The fish pond will be in the area between your farm house and the exit to the rice paddy / waterwheel area. To stock the pond, take one fish that you've caught and place it into the water. You can use any fish you've caught when bare-handed or equipment fishing except for a King Fish. The fish will remain in the pond until you have removed it. To increase the number of stars your fish has, feed it Fish Food once per day. You can buy Fish Food from Raul's Konohana Shop once you have the fish pond built on your farm. The Fish Food costs 150 G each. The amount of Star Points each daily feeding earns will depend on the actual number of fish in your pond; the more fish you have, the slower the star rank increases. 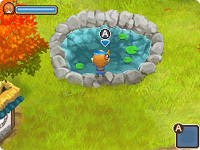 The fish in your pond will multiply in numbers automatically as you leave them in the pond. You do not have to feed the fish to make them multiply. Feeding the fish will only affect their star rank and nothing more. The number of days it takes before a fish breeds will depend on the fish species. The lower the fish's shipping price, the faster it will breed. The fish pond will hold a maximum of 10 fish and at that point the fish won't multiply anymore. To remove a fish from your pond, just walk up to the pond and press A when prompted. You have to remove each fish one at a time.